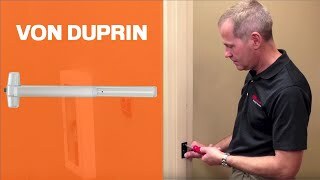 This Von Duprin 99NL rim exit device is a Grade 1, heavy duty product supplied with the night latch pull trim. When in the neutral position the pushbar projects 3-3/16" and when it is depressed it projects 3-1/16". Supplied with 299 strike in dull black. 99NL Exit devices include 990NL trim.